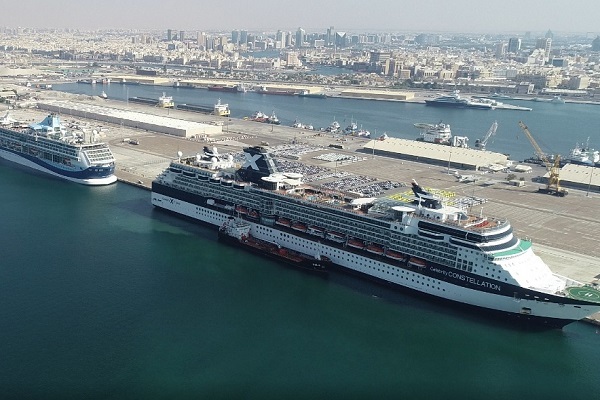 Port Rashid received five international cruise liners at the Dubai Cruise Terminal on a single day, marking a historic milestone during the 2018/2019 season. The cruise lines originating from UK, US, Germany, Italy and Spain brought in over 25,000 tourists. The milestone event forms part of the ongoing efforts of the recently formed Dubai Cruise Committee to raise the profile of Dubai as a leading destination for winter sun cruising and reaffirming its position as the “Cruise Hub of the Region”. The cruise ships included Marella Cruises’ Marella Discovery, Aida Cruises’ Aida Prima, MSC Cruises’ MSC Splendida, Pullmantur Cruises’ Horizon, and Celebrity Cruises’ Celebrity Constellation. Three of them marked their maiden call to Dubai, while one marked its debut ship call of the cruise line to the region. Meanwhile, three of these cruise lines will be homeporting in Dubai for the full season operating the regular Arabian Gulf routes, with the remaining ships docking in the city for excursions and passenger turnaround as a part of their long international programmes, said a top official of Port Rashid. Six cruise lines with a total of seven ships will homeport in Dubai this season opening up multiple options for tourists to choose in addition to over 20 other world-class cruise lines operating longer international itineraries on which the tourist can choose to embark from Dubai. The Cruise Terminal at Port Rashid witnessed a noticeably growing traffic in cruise tourists in the last years. The number of cruise tourists to Dubai has doubled since 2014 from 320,000 in 2013-2014 season to 625,000 in 2016-2017, it stated. The number of cruises to Dubai grew by 68 per cent from 93 in 2013-2014 season to 156 cruises in 2016-2017. Around 1.9 million cruise tourists have made it to Dubai in 4 seasons since 2013-2014 to 2016-2017 season on 489 cruise liners. Sultan Ahmed bin Sulayem, Group Chairman and CEO of DP World, said: "The arrival of 25,000 cruise tourists in a single day underlines Dubai’s growing presence in world cruise tourism and is evidence of the success of Dubai Cruise Terminal’s role in making this possible, following the wise vision of HH Sheikh Mohammed Bin Rashid Al Maktoum, Vice President, Prime Minister and Ruler of Dubai. "Our state-of-the-art facilities, world class infrastructure, and connectivity have laid the foundations for a robust sector that will see continued growth moving forward. Between 2013 and 2017, our world class Hamdan bin Mohammed Cruise Terminal has seen a 68 per cent increase in cruise ship calls, and tourist numbers arriving at our Mina Rashid facility have doubled from 320,000 to 625,000 during the same period," remarked Sultan Ahmed. "We will continue to provide support through the development of infrastructure and facilities that will create a unique experience that caters to the sophisticated standards visitors expect and deserve," he added. P&O Marinas and Port Rashid CEO Mohammed Al Manaei said: "Receiving these luxury cruise liners on a single day indicates the great capability of Port Rashid and its readiness to deal with the growing demand in cruise tourism in Dubai." The Cruise Terminal at Port Rashid enjoys the best and most modern facilities and is well equipped to ensure highest levels of satisfaction and a pleasure journey and stay to all cruise tourists. "We are working to develop the facilities at the port to have an even better and more advanced infrastructure and facilities and better connection to other ports," noted Al Manaei. The three cruise liners which marked their maiden call to Dubai included Marella Discovery, arriving after their rebranding from Thomson Cruises, the UK’s third largest cruise line; Aida Prima and Pullmantur Horizon marking the start for their homeporting calls. Aida Prima with 16 calls in 2018/19 season is expected to bring over 60,000 cruise tourists to Dubai and Pullmantur Cruises marked its debut in the region with its cruise ship Horizon and is set to welcome over 45,000 cruise tourists via 14 calls to Dubai during the ongoing season. Meanwhile, MSC Cruises will deploy two ships in the region with Dubai as its homeport for the first time with a total of 28 calls will bring in over 120,000 cruise tourists, said the top official.